The end of the year is the best time to take advantage of EV tax credits, as buyers are able to claim them quickly, getting the clearest picture of their anticipated liability. In addition to cutting-edge technology and performance, state and federal tax credits are helping to make buying an electric vehicle (EV) an even smarter choice. 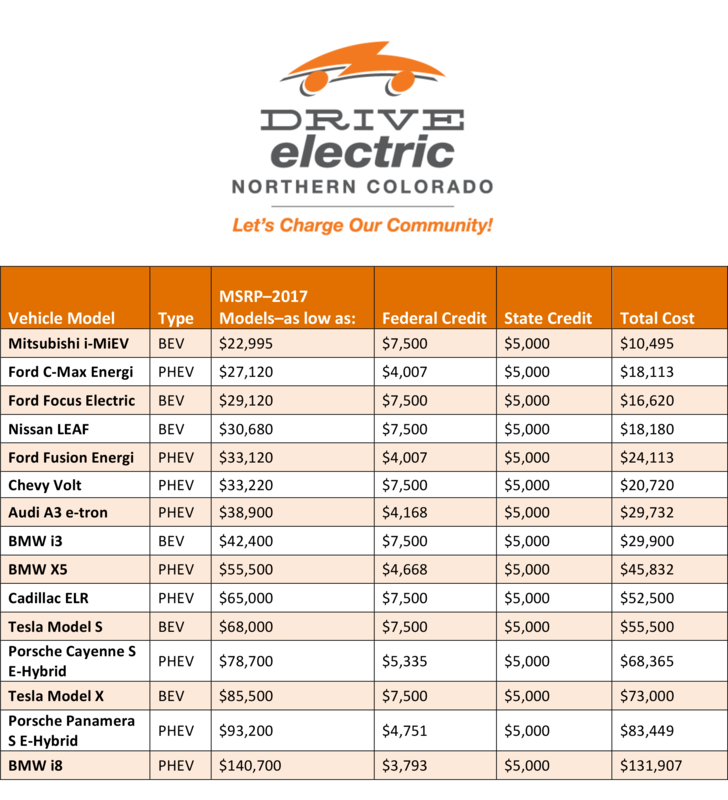 Alongside a federal tax credit of $7,500, Colorado residents are able to claim an additional state credit of $5,000 at point of sale when they buy an EV. Together, these incentives significantly reduce the cost of buying an electric vehicle – more than 40 percent in some cases. For tax years beginning on or after January 1, 2010, but prior to January 1, 2022, the innovative motor vehicle credit and the alternative fuel vehicle credit are refundable. The credit is first applied against the income tax liability of the person who purchases, leases, or converts the qualifying motor vehicle. If the credit exceeds the tax due, the excess credit will be refunded. Below are a list of Plug In Hybrid Electric Vehicle (PHEV) models and Battery Electric Vehicle (BEV) models that are currently available on the market in Northern Colorado. Click on the image below to enlarge. The prices listed below do not yet include the great deals available on EVs from local dealership. For more information on cost savings visit the DENC Cost Comparison Calculator. To hear from current EV owners about their experiences applying for tax credits, watch the following video. When viewing the video, please note that there has been a change to the tax credit website. You can now find all materials by visiting driveelectricnoco.org/tax-credits. To help spread the word about EV tax credits click the icons below or click here. Most plug-in electric vehicles are eligible for federal and state tax credits. The federal government offers a tax credit of between $2,500 and $7,500 for vehicles with batteries of at least 4kWh capacity. The Nissan LEAF, Chevy Volt, and BMW i3 are all eligible for the maximum tax credit. The Department of Energy and the Environmental Protection Agency update the list of eligible vehicles and the value of the credit for each eligible vehicle every year. Taxpayers must have tax liability equal to or greater than the credit to be eligible. The tax credit cannot be used at the time of purchase, but does reduce the taxpayer’s tax owed dollar-for-dollar. The state of Colorado also offers a tax credit for the purchase of alternative fuel vehicles, including plug-in electric vehicles. As of January 1, 2017 the value of the credit is a flat rate of $5,000 that can be applied at the time of purchase. These credits can have a meaningful impact on the economics of purchase decisions for both individuals and fleets in Colorado. See also, economic savings and fleet advantages, and visit our comparison calculator to compare the different aspects of electric vehicle ownership with petroleum-powered counterparts.